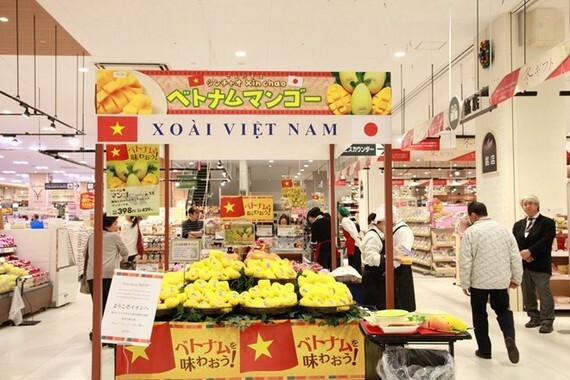 Vietnamese fruits are becoming more and more popular in the Japanese market, reflected through $170 million in export turnover of fruits and vegetables in 2017, an increase of 70 percent against the previous year. This was revealed by Ta Duc Minh, Vietnamese trade counsellor to Japan, during Japan’s largest international food and beverage exhibition, Foodex Japan 2018, which opened on March 6 in Chiba city. Up to 20 Vietnamese enterprises from various cities and provinces, such as HCM City, Hanoi, Nghe An, Bac Giang, Ninh Binh, Dong Thap, Ben Tre, Can Tho, Kien Giang, Lam Dong and Ca Mau, which are active in the field of agro-fisheries and food export, took part in the event. The event offers Vietnamese businesses opportunities to promote their exports in the Japanese and other Asian markets. Besides this, it is an opportunity for Vietnam’s firms to develop new export items, sign valuable export contracts, and promote a wide range of Vietnamese food and agricultural products. Earlier, Vietnamese products were exported to Japan in the form of semi-finished products; however, recently, Vietnamese enterprises have focused on investment and technology cooperation with Japanese enterprises, helping Vietnamese products meet the quality standards of the Japanese market, Minh added. The four-day exhibition attracts 3,350 firms from 80 countries and territories worldwide, and is expected to welcome some 85,000 visitors.